In our house there are three aromas that draw my kids to the kitchen, one of them being homemade bread baking. The hearthy scent of a yeasty bread drives you to the back 40 to milk the cow in preparation for some fresh, whipped butter to top what is soon coming out of the oven. Add all ingredients in the order listed in the pan of your bread machine. Select the dough cycle and start the process. Keep an eye on the dough to make sure it is not to dry or wet. You want it to be a ball that does not stick to the sides once it is thoroughly mixed. If it is too wet, sprinkle more flour. If it is too dry, sprinkle some warm water. When the dough cycle is completed, simply divide into two balls. Place a piece of parchment paper on your pizza/bread stone or cookie sheet. Form dough into two loaves on parchment paper. 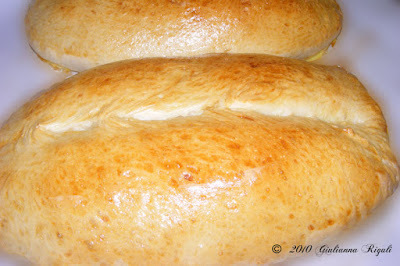 Cover loaves with a damp cloth and allow to rise in a warm place for about 40 minutes. Brush loaves gently with egg wash and using a sharp knife, split the loaves down the middle very quickly. Place your bread in the oven, turn the heat up to 375 degrees and bake for about 20-30 minutes until the loaves are golden and sound a bit hollow when you thump on them. Options: You can sprinkle the egg wash with garlic, Parmesan, or herbs before baking.